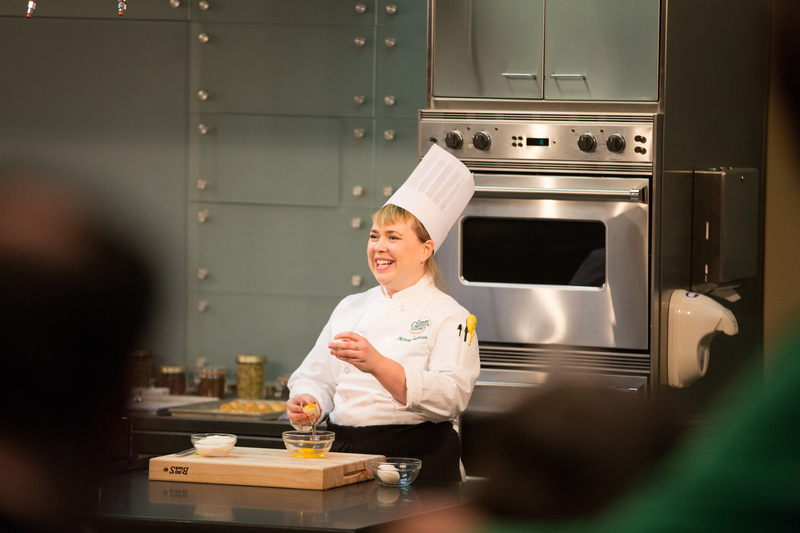 Napa, CA – The Culinary Institute of America (CIA) at Copia, the ultimate Napa Valley destination for exploring, experiencing, and enjoying the world of food and wine, is pleased to add new class formats and seasonal themes to its instructional calendar. From knee-high novices to kitchen whizzes, there’s a cooking class for every age and experience level. Among the newest classes are wine & cheese pairings with cheese expert Janet Fletcher, hands-on Thai cuisine, and seasonal desserts and cocktails. Classes are open to the public and require no advanced skills. Descriptions for upcoming classes are below, with demos, dinners, and classes listed first, followed by beverage tastings. Prices are per person. Classes run from one to three hours. Tickets and class descriptions can be found online. A day-by-day calendar can be viewed online. A small, hands-on class concluding with a meal and wine. New Cooking with Beer—Sept. 1, Sept. 23, Oct. 28, and Nov. 25 at 4:30 p.m.
New Grilling Like a Pro—Sept. 2 at 11 a.m.
New Spice It Up!—Sept. 9 at 4:30 p.m.
New The Power of Sauces—Sept. 16 and Oct. 21 at 5 p.m.; Nov. 18 at 4:30 p.m.
New Cooking with Wine—Nov. 4 at 4:30 p.m. Handmade Fresh Cheese—Sept. 29 at 4:30 p.m. Flavors of the New Spanish Table—Sept. 22 at 4 p.m. Through interactive tasting and sensory experiments, learn how to turn up the flavor volume in favorite foods at home. Sept. 2 at 3:30 p.m.
Sept. 21, Oct. 14, and Oct. 28 at 11 a.m.
Master some of the culinary world’s biggest secrets and techniques and walk away with pro skills. New Thai Time (Level 2)—Sept. 1 at 2:30 p.m.; Sept. 8 at 12 p.m.; Sept. 12, Sept. 28, and Sept. 30 at 1:30 p.m.; Sept. 23 at 2 p.m.
New Rustic Desserts—Oct. 6, Oct. 21, Oct. 28, and Oct. 31 at 1:30 p.m.
New The Mediterranean Table—Oct. 7, Oct. 14, Oct. 17, Oct. 24, and Oct. 27 at 1:30 p.m. Seasonal Celebrate Harvest with Grape Recipes—Sept. 5, Sept. 7, Sept. 19, and Sept. 22 at 1:30 p.m.; Sept. 16 at 2:30 p.m. Seasonal Fall Strudels and Turnovers—Sept. 26 at 10:30 a.m.; Nov. 4 at 2 p.m.; Nov. 14 and Nov. 25 at 1:30 p.m. Seasonal Pies & Tarts for the Holidays—Nov. 18, Nov. 21, and Nov. 24 at 1:30 p.m.; Dec. 9 at 2:30 p.m.; Dec. 16 at 2 p.m. Seasonal Healthy Holidays—Dec. 6 at 3:30 p.m. Seasonal Unrivaled Hors d’Oeuvre—Dec. 9 at 11 a.m.; Dec. 12 at 1:30 p.m.
Homemade Fresh Cheese—Sept. 6, Sept. 13, Oct. 18, and Nov. 15 at 3:30 p.m.; Oct. 12 and Nov. 28 at 1:30 p.m.; Oct. 13 at 12 p.m.; Nov. 3 at 3 p.m.; Dec. 7 at 2:30 p.m.
Food for Entertaining—Sept. 21, Oct. 5, Oct. 26, and Nov. 2 at 6 p.m.; Oct. 8 and Oct. 14 at 5 p.m.
Farm Fare—Sept. 3 at 5 p.m.; Sept. 14 at 6 p.m.
Pasta—Sept. 30 at 5 p.m. Learn how to safely and deliciously preserve foods, from carrots to confit. The Quick Pickle—Sept. 15 at 3:30 p.m.
Curing, Drying, Confit—Oct. 20 and Nov. 17 at 3:30 p.m.; Nov. 2 at 3 p.m. Learn how to enhance either the flavor of the wine or the food to elevate your next dining experience. New Global Flavor Interactions—Sept. 9 and Oct. 21 at 11 a.m.; Sept. 26 at 1:30 p.m.; Sept. 28 at 3:30 p.m. Basic Flavor Interactions—Sept. 14 at 3 p.m.; Nov. 4 and Nov. 24 at 11 a.m.; Nov. 16 at 3:30 p.m.; Dec. 1 at 2 p.m.
White with Fry, Red with Roast?—Sept. 8 at 3:30 p.m.
Let’s Talk About Sauces—Sept. 22 and Sept. 30 at 11 a.m.; Oct. 19 and Dec. 14 at 3:30 p.m.; Nov. 17 at 1 p.m.
Interactive, family-friendly Sunday classes teach kid-friendly cooking techniques. New Cakes and Cupcakes—Oct. 1, Oct. 22, and Dec. 10 at 1:30 p.m.
New Tacos—Oct. 8 and Nov. 5 at 1:30 p.m.
New Mac & Cheese—Oct. 15 at 1:30 p.m.
New Cool Condiments—Sept. 17 at 1:30 p.m.
New Hidden Vegetables—Sept. 3 at 1:30 p.m. Seasonal Spooky Treats—Oct. 29 at 1:30 p.m. Seasonal CIA Holiday Favorites—Nov. 19 at 1:30 p.m. Seasonal Lunchbox Magic Featuring Thanksgiving Leftovers—Nov. 26 at 1:30 p.m.
Pizza—Sept. 24 at 1:30 p.m.
Lunchbox Magic—Sept. 10 and Dec. 3 at 1:30 p.m.
Master basic cooking techniques that serve as a starting point for many other recipes. Make Your Own Condiments—Sept. 7 at 11 a.m.; Sept. 15 and Oct. 20 at 1 p.m.
Make Fresh Pasta—Sept. 29 at 11 a.m.; Oct. 13 at 2:30 p.m.; Nov. 10 at 1:30 p.m.; Nov. 16 at 12:30 p.m.; Dec. 8 at 3 p.m.
Make Eclairs & Their Cousins—Nov. 18 and Dec. 16 at 11 a.m.; Nov. 30 at 1:30 p.m.; Dec. 21 at 3:30 p.m. This expert-led tasting class offers insights into particular styles of drinks and food pairings. New Wine and BLTs—Sept. 2 at 5:30 p.m.
New Class Cocktails with a Twist—Sept. 4 and Oct. 9 at 4 p.m.; Sept. 27 at 5:30 p.m.
New What We’re Drinking Now—Sept. 7 and Oct. 12 at 6 p.m. Seasonal Cocktails from the Garden—Sept. 15 at 6 p.m. Learn how to create wine-and-cheese marriages that make sparks fly with cheese authority and best-selling author Janet Fletcher. Sept. 1 and Oct. 6 at 11 a.m.
Oct. 20 at 6 p.m. This comparative tasting will attempt to answer a variety of questions about flavor preferences and characteristics of different regions around the world. Sept. 16 at 11 a.m.
Nov. 27 at 6 p.m. In one of CIA at Copia’s most popular classes, you’ll taste wines, learn the lingo, understand what you prefer, and how to enjoy it with food, family, and friends. Sept. 1, Oct. 7, and Oct. 12 at 11 a.m.
Sept. 14 and Oct. 19 at 12:30 p.m.
Sept. 29 at 2 p.m.; Nov. 17 at 6 p.m.; Dec. 13 at 3:30 p.m. This class explores six examples of sometimes secret, sometimes rare, but always delicious wines, as well as shares stories about Napa Valley’s pioneers and visionaries. Sept. 20 and Oct. 25 at 6 p.m.
Sauvignon Blanc—Sept. 25 at 6 p.m.
Pinot Noir—Oct. 30 at 6 p.m.
Cabernet Sauvignon—Sept. 11, Oct. 2, Oct. 16, Nov. 1, Nov. 13, Nov. 29, and Dec. 11 at 6 p.m. Learn about buying, serving, and creating fun pairings for sparkling wine and compare bubbly from many price points and styles. Sept. 18, Oct. 23, Nov. 22, and Dec. 8 at 6 p.m. In addition to attending classes and demos, visitors will find much to do at the CIA at Copia, including daily wine tasting in the Tasting Showcase, dining, book signings, and browsing culinary and wine collections. Shoppers won’t want to miss The Store at CIA Copia, featuring an extensive collection of cookbooks by CIA faculty, alumni, and guest chefs, as well as artisanal food products, cookware, glassware, one-of-a-kind pottery, and more. The Restaurant at CIA Copia is a destination for innovative, market-based, globally inspired, California cuisine that pairs perfectly with Napa Valley wines and craft cocktails. Throughout the property, guests will find culinary artifacts, museum collections, and one-of-a-kind sculptures, which are open to the public and can be viewed at no charge. The Chuck Williams Culinary Arts Museum and a state-of-the-art teaching kitchen are slated to open in late 2017.